"When Kim Hatfield was in high school, she won a contest for designing a flag that represented her native Madison County. On Saturday morning - 35 years later - her flag will be raised outside the Madison County courthouse as part of the county's 175th anniversary. "I think it's kind of neat," Hatfield, 53, said of her design, which will become the county's first permanent flag. Huntsville Mayor Kevin Hatfield, who is Kim Hatfield's brother, said his sister's flag was "forgotten in time" before the county decided to revive it. "Symbols are important to people," the mayor said. "[This flag] represents what we are all about. It's going to be our permanent flag." 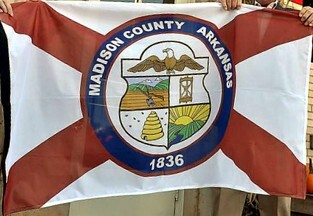 Huntsville plans to fly the new Madison County flag in city parks, at City Hall and at the fire station, he said. Madison County Judge Frank Weaver said no one can see the flag until it is unveiled Saturday. Saturday's flag-raising celebration will be a "birthday party" for the county and a time to remember the past, officials said Thursday. Madison County became a county on Sept. 30, 1836, the same year that Arkansas became a state. County officials paid $200 to produce Kim Hatfield's 3-by-5-foot flag, but others can be produced for the county at a reduced price, County Clerk Faron Ledbetter said. In 1976, when Kim Hatfield decided to enter the flag contest, her mother sat her down at the family's table and said, "What do you think about when you think of Madison County?" Kim Hatfield wrote down ideas: a sunrise over a mountain, a farming plow, a beehive to symbolize the economic activity in the county and an hourglass to show time and history. The ideas went into her design. On Friday, as part of the celebration, more than 300 historic photographs will be on display at the Madison County Courthouse. Across the street at the Masonic Hall at least 70 handmade models of historic buildings will be on display.